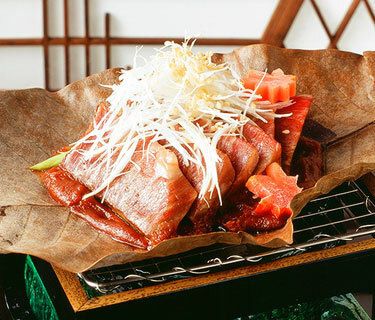 Houba-yaki is a dish prepared by grilling miso (soybean paste) and other ingredients on a leaf of the Japanese Magnolia ("hou" in Japanese), which grows in the alpine forests of the Hida Region (in the northern part of Gifu Prefecture). It represents the local cuisine of the Hida Region, wherein you can enjoy the aroma of magnolia leaves and miso. The rich taste of Tajima Beef goes perfectly with the flavor of miso. 1) Cut the beef into bite-sized pieces. 2) Put white miso paste, sakura-miso, sake, sesame paste and egg yolk in a pan. Dissolve the miso and place over low heat. Knead slowly until the mixture regains the original firmness of the miso. 3) Slice white leek into juliennes and plunge in water. Slice green leek diagonally. 4) Cut up carrots into maple leaf shapes and blanche them. 5) Soak magnolia leaves in water so as to make them tender. Drain the leaves and spread the miso paste prepared in (2) over them. Place the beef, leeks and carrots on top and sprinkle roasted sesame seed on top of it all. 6) Place the magnolia leaf with miso and other ingredients over a charcoal fire and roast the beef by yourself while eating. produce a beef of world-class quality. Its characteristics include the depth and richness of its taste particular to beef. When heated, the marbled fat melts on the tongue and the taste of meat and scent of fat blend magically, forming the unique taste of Tajima Beef. Magnolia leaves are sold in dried form. They regain their tenderness when soaked in water. The leaves are somewhat heat-resistant and as such they can be placed directly over fire. When kneading miso, be careful to dissolve the miso completely before placing it over heat. When it starts simmering, stir well and knead the paste until it reaches a texture somewhat firmer than mayonnaise. It becomes firmer when cooled.